Let’s have some fun with the rabbits, chicks and Easter Eggs! 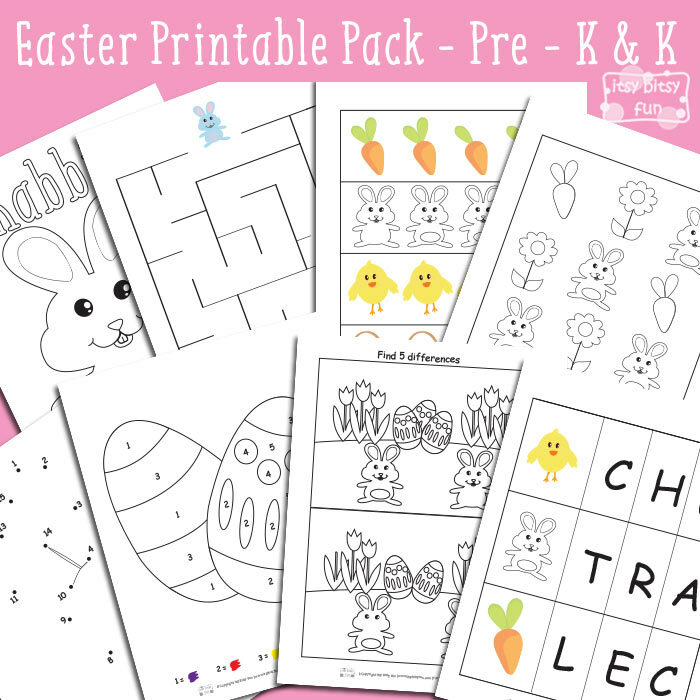 This sweet printable Easter pack is perfect for kids in kindergarten and preschool. 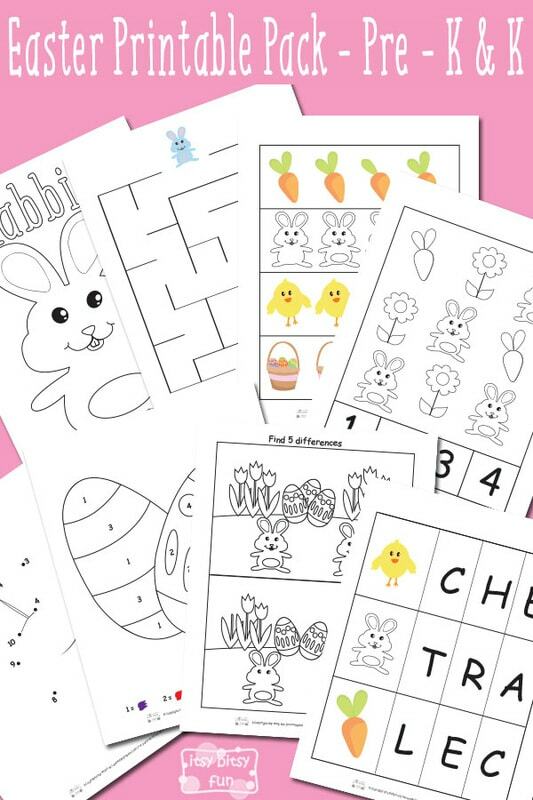 Learning with Easter worksheets can be fun – if they are fun! Hands on activities are always the best choice to get the kids started but sometimes you just need to grab a pen and a piece of paper to do some seriously fun work. This pack has 8 pages packed with simple activities that will help with problem solving, counting and beginning letters amongst other things. This pack has 8 pages! There is one coloring page with this cute little bunny rabbit (and a word rabbit to color). Next we have a simple to solve maze where kids have to help the bunny to get to his (or her) carrot. There’s one page where kids have to spot an image that is different from others in the row. Next is the counting page where kids have to either count carrots, bunnies or flowers and color the square with the correct number. There’s also a pretty simple dot to dot page with numbers from 1 to 15. There is also a color by numbers page with numbers from 1 to 5. Next in line is spot the differences activity where kids have to find 5 differences between two images. Last but not least there’s a page where kids have to circle (or color) the letter with which the illustrated object starts with. Get your free printable Easter Worksheets for Preschool and Kindergarten here. You know what will make learning even more fun? If kids pretend play while they do these – so quickly print these free printable Easter masks and let the fun begin! easterIf you have younger kids at your home they will also enjoy these Easter file folder games!